Rockville, Md. 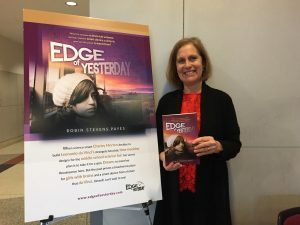 (April 15, 2017) – In a debut novel, Edge of Yesterday (www.edgeofyesterday.com), author Robin Stevens Payes, brings Leonardo da Vinci and his visionary powers to life through the eyes of a modern-day teen. When 13-year-old Charley Morton decides to build Leonardo da Vinci’s plans for a time machine for the middle school science fair, she has two thoughts in mind: to win first prize and to travel back in time to meet her Renaissance idol, Leonardo. “The idea of building a time machine and making it work were ideas that got Charley laughed at and ridiculed by her friends,” said Payes. “But she was determined to meet her own ‘Superhero of History,'” Payes explained. By featuring a determined teenage girl with a big dream, Edge breaks new ground in creating a strong, resilient protagonist with a sense of humor and big dreams. Through Charley’s story, teens are invited to find and share their own. To read a story sample from the novel Edge of Yesterday, and find more information on learning through story, visit www.edgeofyesterday.com.